The Royal Canadian Moped Posse: Bingo's up for grabs! 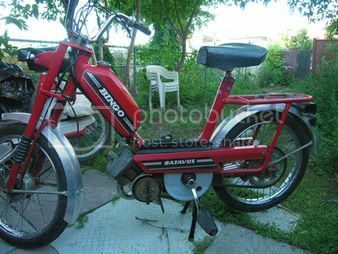 The time has come, I hate to say, but I'm putting my Batavus Bingo up for grabs. It runs great, it's a fast little bugger too, you've all seen it run. Needs new foam under the seat, which I have, and that's about it. I want $700 for it and I'm quite firm on that price as I really need the money. So if you know anyone looking for a bike, let me know or give them my email (motormatic@gmail.com).